Blackjack is played at the table as illustrated with the players sitting around the boxes facing the dealer. 6 packs of cards are used and are dealt from a shoe. Cards have their face value, with picture cards counting as ten. The ace is given the value of either one or eleven, the choice being the player’s. The object of the game is for the player to hold the hand with the higher total than the dealer, up to a maximum of twenty-one. A player who draws a card, which gives him/her a total exceeding twenty-one loses. A two-card hand of twenty-one (an ace and a ten card) is “blackjack” and beats all other hands. After the players have bet by placing their stakes before the boxes in front of them, the dealer deals a card face up to each box, beginning on his left, and then one to himself. He then deals a second face-up card to each box, but not to himself. The dealer then completes the hands of all the players in turn, beginning with the player to his left. If a player is satisfied with his two-card count, he may “stand or Hold”. Otherwise, he will continue to draw extra cards, usually by asking to “Hit or Card” until he is satisfied with his count, or until he exceeds twenty-one, when he loses. When all players’ hands are complete, the dealer will deal himself a second card. He has no options. He must draw a further card with a total of sixteen or less, and may stand with a total of seventeen or more. A blackjack is a total of 21 in your first two cards. A blackjack is therefore an Ace and any ten-valued card, with the additional requirement that these be your first two cards.. The distinction is important, because a winning blackjack pays the player odds of 2 to 1 (3 to 2 in a real casino). A player blackjack beats any dealer total other than a dealer’s blackjack, including a dealer’s regular 21. If both a player and the dealer make blackjack, the hand is a tie or push. If your initial hand totals 9, 10, or 11 and you think that with just one more card you will be able to beat the dealer; you have the option to double your original bet and draw one, and only one card. To signal the dealer your intention to double down, simply place another bet up to the amount of the original bet alongside your first bet. When the first two cards you receive are of equal value other than a pair of 4’s, 5’s or 10,s, you may elect to split them and play each as a separate hand, drawing to each until you are satisfied or break. You play the right card first followed by the left card. In many casinos, if a pair is split and a third card of the same rank is drawn, the hand may be re-split. To indicate to the dealer your desire to split, merely slide up another bet of equal value next to your first wager, touching neither your cards not the original bet. If the dealer turns an up-card of an Ace, he will offer “Insurance” to the players. Insurance bets can be made by betting up to half your original bet amount in the insurance betting stripe in front of your bet. The dealer will check to see if he has a 10-value card underneath his Ace, and if he does have Blackjack, your winning Insurance bet will be paid at odds of 2:1. You’ll lose your original bet of course (unless you also have a Blackjack), so the net effect is that you break even (assuming you bet the full half bet for insurance.) 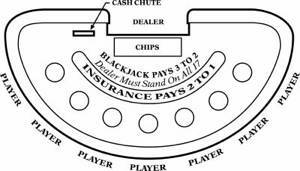 This is why the bet is described as “insurance”, since it seems to protect your original bet against a dealer blackjack. Of course, if the dealer does not have blackjack, you’ll lose the insurance bet, and still have to play the original bet out. The situation is often thought to be different when you have a Blackjack. The dealer is likely to offer you “even money” instead of the insurance bet. This is just the same old insurance bet with a simplification thrown in.